Today's the day! The iPhone 6s and 6s Plus made it into the hands of millions of eager Apple fans -- and one robot -- today. Last week when Tim Cook appeared on “The Late Show with Stephen Colbert”, the host asked Cook what he thought about the current crop of movies about Jobs, some of which are less than flattering about the late Apple CEO. Aaron Sorkin’s movie Steve Jobs has been labeled as a critical dramatic interpretation of three key episodes in Jobs’ life, while the documentary “Steve Jobs: The Man In The Machine” takes a very harsh view of Jobs’s impact on the consumer electronics industry, family and friends. Cook — who hadn’t seen either film last week — said “I think that a lot of people are trying to be opportunistic and I hate this, it’s not a great part of our world.” Well, Sorkin, who has won Academy Awards, Golden Globe Awards, and Emmy awards for his screenwriting, didn’t take lightly to being called opportunistic. 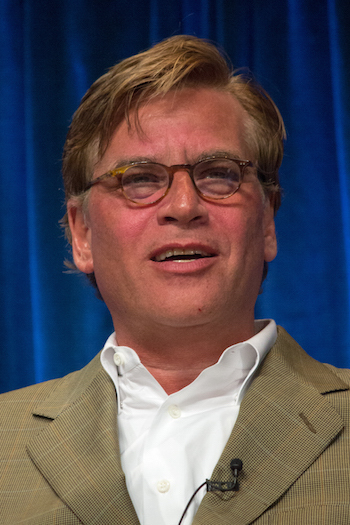 In a response printed in The Hollywood Reporter, Sorkin noted that he and some of his team took pay cuts to get the movie made, told Cook that he should see the movie before he decides what it is, and ended with a full body slam, saying “If you’ve got a factory full of children in China assembling phones for 17 cents an hour you’ve got a lot of nerve calling someone else opportunistic.” Ouch. The lines have crossed, and we’re not talking about the ion beams in the movie Ghostbusters. We’ve been closely watching the iOS 9 adoption rate numbers from Mixpanel, which we feel more closely represent the actual adoption rates than what Apple estimates. Those numbers are now showing that iOS 9 is installed on 48.43 percent of all iOS devices, iOS 8 is on 44.92 percent, and previous operating system versions are just on 6.65 percent. That’s a pretty fast adoption rate for the new operating system. Remember yesterday when we told you about an Australian woman who had sent a telepresence robot to the Sydney Apple Store to stand in line? Well, Apple’s Palo Alto store may have been the first store to sell an actual iPhone 6s via telepresence when Brianna Lempesis, an employee of robot manufacturer Suitable Technologies, sent a Beam telepresence robot into the store to buy the phone. She was interviewed on TV via the robot’s large display many times while waiting to get in, and also had a secret — she had stashed money for the iPhone in a rear panel of the robot and told an Apple employee how to retrieve it. Once purchased, the iPhone was put into a bag and placed onto a hook on the side of the robot. Lempesis didn’t think that anyone would steal the iPhone, saying “I really think people are better than that and so far that’s what I experienced.” The robot’s home is just a short walk away from the Apple Store, and it and its fellow bots can often be seen on the street talking to passersby.